Trade associations understand the impact that government legislation and regulations have on their members. PACE provides support and guidance to trade associations in numerous areas, including the creation of government affairs programs, as well as the development of political action committees. PACE regularly works with trade association Board members and industry leadership to develop policy and advisory committees, monitoring activity at the federal level, and advocating on their behalf for and against specific legislation and proposals. The PACE team has developed and presented testimony on behalf of clients before the US Congress and numerous state legislative bodies. PACE ensures that government affairs programs work to the greatest benefit of every client. 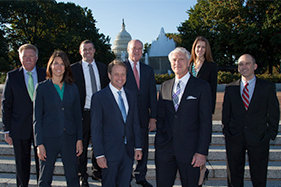 The firm regularly represents many of our trade association clients at conferences, and with ad hoc interest and working groups in Washington, DC. Of particular value to many associations is the firm’s assistance in organizing the government affairs agendas for annual conferences, and securing public policy speakers to address association attendees. PACE is also able to assist in monitoring legislative and regulatory proposals at the state level.